It wouldn’t be Halloween without pumpkin carving. However, once you are finished creating your ghoulish masterpiece, don’t let the rest of your pumpkin go to waste. We’ve put together a range of tasty ideas that will ensure you’ll never overlook those Halloween pumpkin leftovers again. It's just not Halloween if you don't carve yourself a pumpkin or two. But when the day is done and November is well and truly upon us, what do we do to beat the glut? Pumpkin has a reputation in this country for being a bit bland, but a good pumpkin has a delicious sweet, earthy flavour. 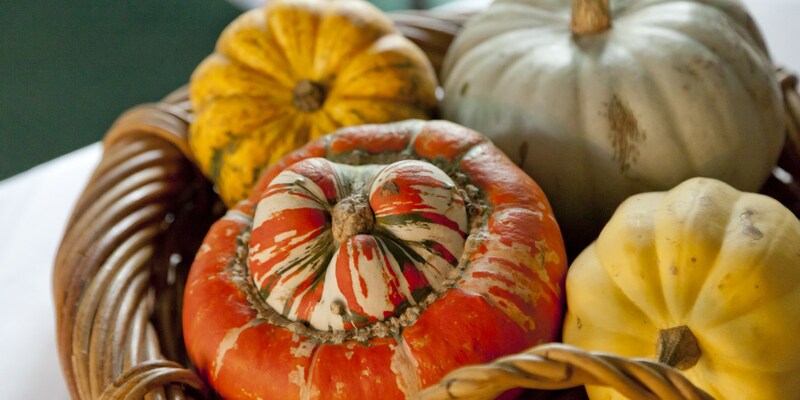 As a good starting point, you can swap pumpkin in for all your favourite squash recipes, or just scroll down for some more inspiration on what to do with those leftover pumpkins! 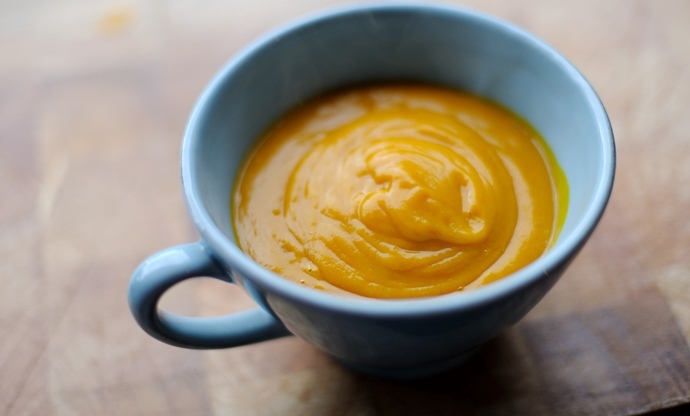 The obvious choice for your leftover pumpkin is a warming soup, perfect for when you just feel like getting cosy on a cold autumnal evening. Try Robert Thompson's Pumpkin soup for something simple and delicious, or substitute the butternut squash for pumpkin in Shu Han Lee’s Chunky butternut squash miso soup with black pepper butter. By the time November comes along, we're normally well on the way to cold, dark winter nights, so what better comfort food than a plate of mash? 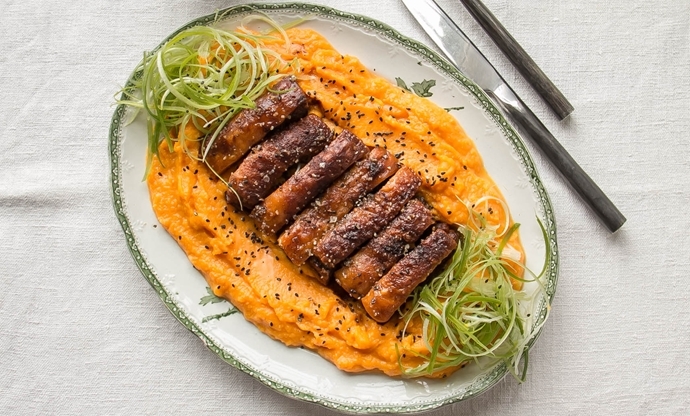 Rosana McPhee's Crispy slow-cooked pork belly with pumpkin mash and black sesame is a good starting point – Rosana beats her pumpkin with milk and butter, and seasons with nutmeg. Pumpkin and pasta are a match made in heaven, and there's so much you can do with the combination. 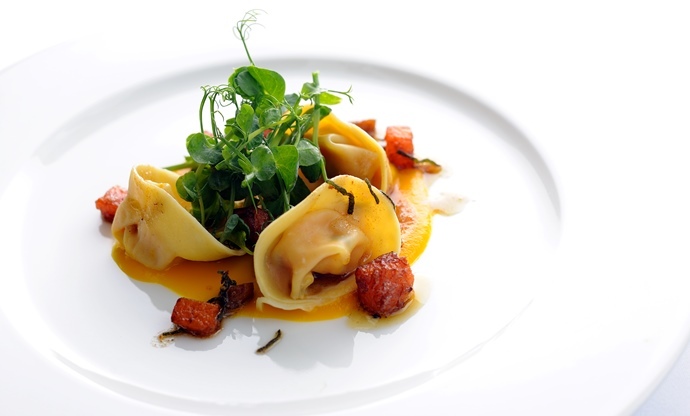 Stephen Crane's Pumpkin tortellini with chestnuts and sage beurre noisette is a beautiful, classic combination of autumnal flavours, or try out Aaron Patterson's Colwick cheese tortellini with pumpkin velouté for something a little more complex. Famed for its silky smooth texture and lightly spiced flavour, Pumpkin pie is a go-to recipe when it comes to using this winter vegetable in a dessert. 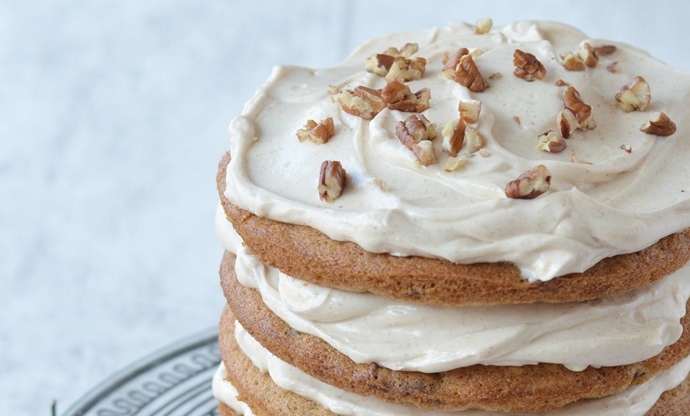 As an alternative, try baking Helen Jessup’s Pumpkin and pecan cake, Victoria Glass's Pumpkin and maple cheesecake or Chantelle Nicholson's Vegan pumpkin meringue pie for an impressive dinner party dessert. Squash or zapallo is a common ingredient in many South American recipes. 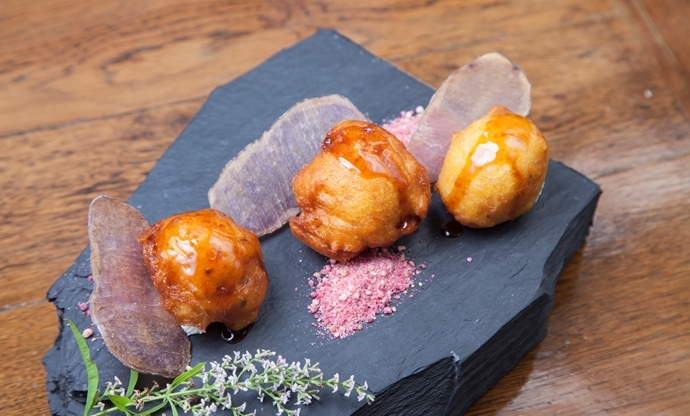 Picarones are a popular Peruvian and Chilean dessert or snack made from pumpkin and sweet potato, topped with chancaca honey. Empanadas, a Latin American pie similar in shape to the Cornish pasty, can also be filled with pumpkin and crumbly feta cheese for a delicious starter. Pumpkin seeds are a great source of vitamins and minerals. To get the most out of the pumpkin seeds’ benefits, try them roasted or toasted as a garnish for soups, salads or main dishes. 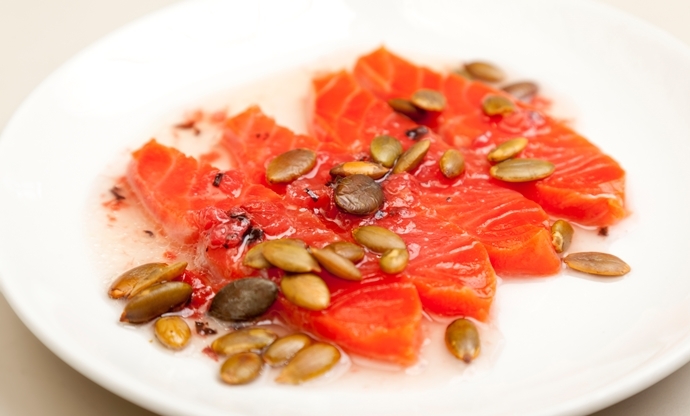 Anna Hansen’s simple Salmon sashimi includes a fantastically easy toasted pumpkin seed garnish with chilli flakes and sea salt. 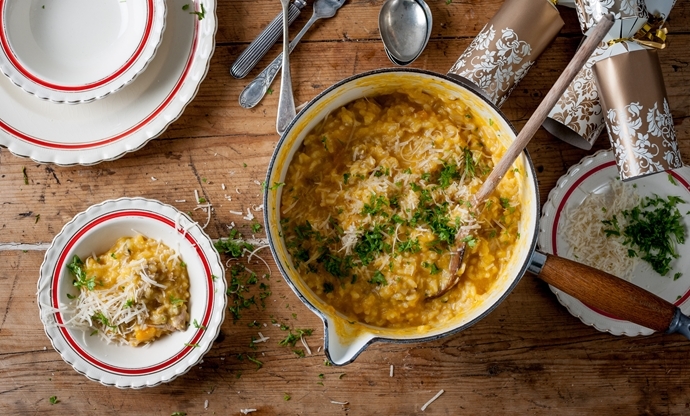 William Drabble's Pumpkin and turkey risotto is a fantastically inventive way of using up leftovers. William cooks down his pumpkin in butter and uses it to create a stock to cook his risotto rice in, making it luscious and creamy. You could swap out any leftover meat or veg to go with it, or eat it on it's own – it's that good. 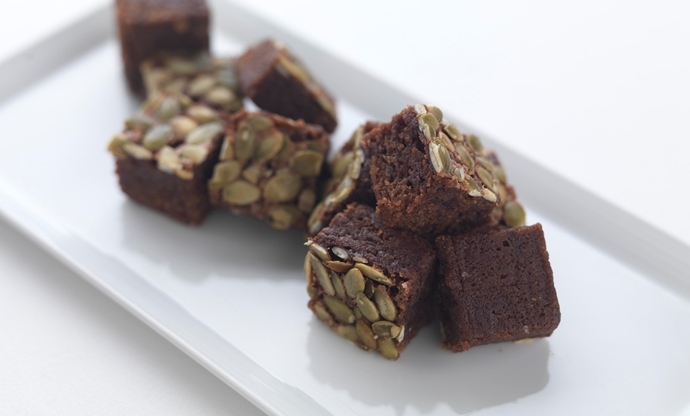 The amazing adaptability of pumpkin seeds make them a perfect ingredient in a wide variety of baked treats. Indulge your sweet tooth with divine desserts, such as Dark chocolate and pumpkin seed brownies or use the delicate nutty flavours of the pumpkin seed for a delicious accompaniment to your cheeseboard with Pumpkin seed and thyme oatcakes. If you're looking for more warming winter comfort meal ideas, the cheesy bake is infallible. 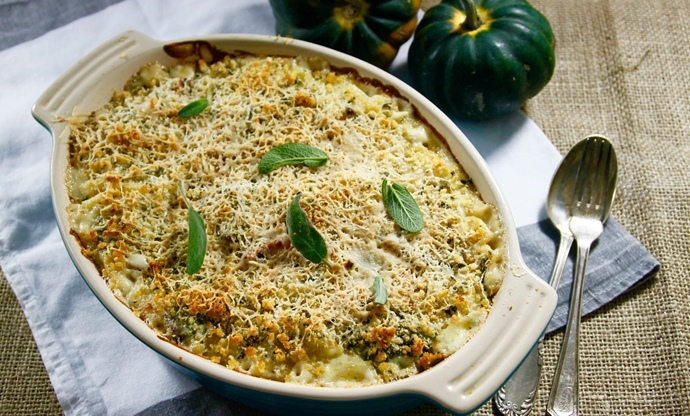 Pumpkin's earthy sweetness works beautifully alongside more potent cheeses – Karen Burns-Booth uses cheddar for her Pumpkin, almond and cheese rice bake, whilst Elly McCausland opts for a punchy blue in her Roast pumpkin, blue cheese and sage macaroni bake. 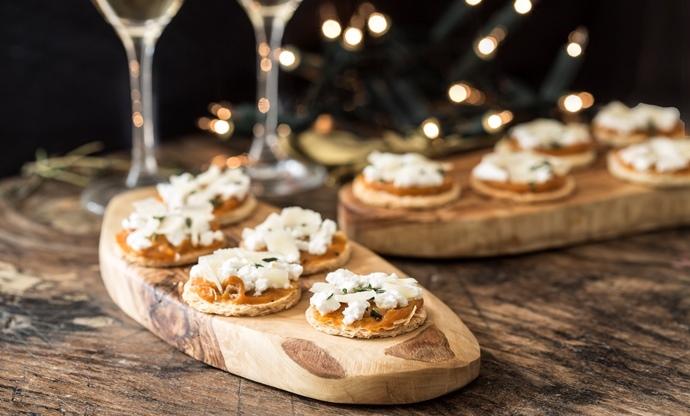 If you've got a dinner party coming up, and a glut of pumpkins at your door, Tom Aikens' Mini pumpkin and ricotta tarts with spiced honey make for fantastic canapés. Don't be dissuaded by the long list of ingredients – the method is actually very simple, and the results are seriously impressive.